For those who are like me and really enjoy getting to know someone before they consider taking the next step…this is for you. And for those who like an “official bio” you can keep scrolling down as I’ve included that as well! I live in Huntington, NY with my husband and three beautiful kids. I grew up in Brooklyn and moved to Long Island when I was 15. I still miss the days when I would cool off in the local fire hydrant or play stoop ball with my brothers. I was called a “good helper” growing up and have come to appreciate that I am and always was really passionate about making a difference. Now it just feels cool to admit it! Given that we live in an age of virtual everything, I am going to answer a few questions you might like to know about me if we actually met face to face and you wanted to get to know me better. 1) How did you get to where you are in your life and with a coaching business geared towards women biz owners? Were you always that bubbly? Your pictures make me think so. Let’s see, how do I share this in a quick and concise way? I grew up in a family where depression and anxiety felt like a constant for me and my mom and dad… my brother’s, I have 2 of them, seemed to be immune to it. I didn’t like my body very much. I became an anorexic and bulimic for a brief period but still always seemed to have those last 10 lbs to lose. I was a super nervous kid and sugar addict. I mean ADDICT. I could eat a ½ gallon of Turkey Hill mint chocolate chip ice cream in one sitting. Yup. I also remember my mom having to pull me out of school mid-day because I would be sweating so badly that no amount of deodorant or clean shirts would help me. In high school I had TMJ and my mouth would wire shut in for hours on end from being so stressed out socially. The one thing I had going for me is that I always knew there was a better way I just didn’t have the HOW at the time. I tried every diet out there and every exercise program… I even tried meditating but could never sit still long enough.… I always wanted to feel better and get those six pack abs but I didn’t know the how. I just knew I wanted a better life and body. I also didn’t know that eating ice cream, cookies and candy & skipping meals were a huge part of the mind and body problems I was experiencing. Fast forward 40 years! I am happily married and have 3 beautiful kids who I taught to see the relationship between sugar and mood. Oh they’re still allowed to eat the ice cream and candy, just not every day or else it becomes a habit. We all eat mostly organic and watch the amount of dairy and gluten because all the added chemicals and hormones really do make you feel crazy! And gluten and dairy really do zap your energy when eaten every day. I recently started playing tennis and continue to work on my golf game because they make me feel happy and proud as a woman…did I mention I LOVE tennis. Oh and here I am at the beach after birthing 3 kids. Like I tell my clients..YES it is possible. Did you know that sugar cravings are the body’s way of telling you that something needs to change? When my clients start to make changes in their lives and tweak their diets, the cravings start to diminish and their energy shoots up. Yup. It’s kinda cool how that works. So to sum all that up….here I am now…. Happily married over 12 years. Believe you me, it takes work to be where I am in my marriage. But it’s worth it! 2) How would you describe yourself? People lover. I love all people. I just can’t help it. Money lover. I love thinking about money, making money and giving it away. 3) How do you know so much about health & business that you call yourself a sugar addiction expert & empowerment coach? Well, I can honestly say I am no longer a sugar addict. I am recovering for the rest of my life just like an addict of anything…. I have been teaching this stuff for over a decade and have tons of testimonials to prove it. Visit Raves on my website for some cool testimonials. When I eat sugar, cause I do, I know exactly what steps to take to enjoy just a little and get back on track the next day. If that wasn’t enough I have 3 kids who are not sugar addicts because I have taught them the rules of eating sugar and they have seen firsthand how they feel after eating avocado and turkey meatloaf vs. pizza and cookies. We do this little exercise 1 hour after eating and I ask them how they feel….they put it together themselves that they feel really tired after eating junk food…and not just that day but the NEXT day too. They self regulate so that it’s not about sneaking junk food when mom’s not around. It’s about them taking care of themselves and choosing foods that make them feel great. I healed myself of a near ulcer, no longer sweat uncontrollably and TMJ is a thing of the past! 4) What are some things that no one knows about you? I survived a gas explosion 3 months after getting married and lost everything I own except 1 cat and my husband. The gas explosion was the wake up call I needed to own my greatness. I got certified as a health coach and quit my day job after 2 years and never looked back. I love to work out and sweat. It makes me feel clean. If I don’t know something I will research it till I feel complete. I still LOVE pizza. I just don’t eat it all the time because it doesn’t make me feel my best self. I always wanted to ski and play golf but didn’t know how. When I met my husband those were the 2 activities he did the most so I learned. I want to rent an RV and travel around the country with my 3 kids and husband for 30 days. I don’t like roller coasters but I jumped out of an airplane when I was 29 and would do it again! I am a huge fan of St. Anthony- the patron Saint of Finding Lost Items…He is one of my best buds…I call on him and 9/10 times I find what I lost! I am a lover. Once I love you I will love you for the rest of my life whether you’re still in it or not! I never thought I could write growing up. I got a B in Writing in College. NOW all I want to do is write. In fact I wrote at 50 page ebook on kicking the sugar addiction and people rave about it. Go figure. I never thought I was very smart growing up but thought I wanted to become a pediatric doctor so I studied harder than anyone I knew. I went on to medical school and left after 1 year because I realized it wasn’t my calling! Board Certified Holistic Health Counselor, 2004- present. 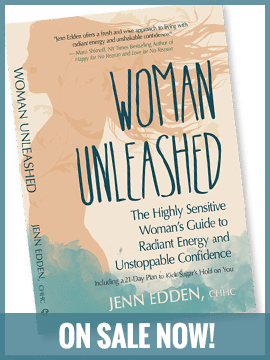 Jenn Edden is a board certified health coach and graduate of the Institute for Integrative Nutrition. She is nationally certified by the American Association of Drugless Practitioners. Jenn specializes in helping women entrepreneurs with sugar addiction and stubborn weight loss. Jenn is also a business coach for wellness entrepreneurs struggling with clarity and confidence. In the late 1990’s, Jenn attended Nova Southeastern University where she studied to become an osteopathic physician. Within a year, Jenn decided to take a leave of absence and pursue other holistic health related careers. Jenn’s journey to becoming a health coach began when she was first diagnosed with gastritis in her early twenties. Doctors concluded that she would need to be on medication for the rest of her life. Jenn knew that wasn’t the right answer for her. With a permanent change of diet and lifestyle Jenn healed herself and then went on a mission to help others heal themselves through smarter food and life choices! After surviving a near gas explosion, Jenn decided that life was precious and short. She became determined to make a difference in other women’s lives. Jenn loves spending time outdoors playing with her 3 amazing kids and outrageously fun husband, Joe. Her other passion is to continue supporting women to take back control of their time and uncontrollable cravings so they can live life on their terms! Ready for a chat? Head on over to Contact Jenn and tell me what’s going on. Not quite ready for that but want to stay in touch…. Join My Newsletter Community to receive your free Six Step Plan to Kick Sugar Addiction + Feel Empowered. Let’s Get This Party Started!